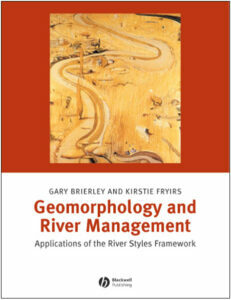 Geomorphology and River Management: Applications of the River Styles Framework. Blackwell Publishing, Oxford, UK, 398pp. Rivers show a remarkable diversity of river character and behaviour in any catchment. Human activities, whether purposeful or otherwise have impacted profoundly on the inherent variability in patterns and rates of river adjustment, altering what rivers look like and how they behave, and the structure and function of aquatic ecosystems. This book outlines a generic set of procedures, termed the River Styles framework that provides a set of tools for interpreting river character, behaviour, condition and recovery potential. River management programs that ‘work with nature’ must respect the inherent diversity and behavioural regime of aquatic ecosystems. Each catchment is managed in its own right, recognizing the patterns and connectivity of river forms and processes, as shaped by the configuration of the system and responses to disturbance events. Applications of the River Styles framework generate a coherent package of geomorphic information, providing a physical template for river rehabilitation activities. This book will suit a wide range of river practitioners, including students, technical officers, consultants and academics. 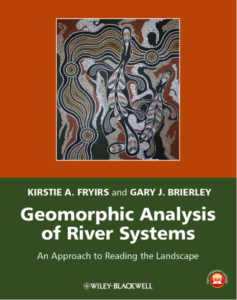 “River lovers and anyone else interested in handson river system management will find the new Brierley and Fryirs book an interesting and useful read. The book, organized into three large sections, begins by taking a quick but lavishly illustrated look at the basics of fluvial geomorphology, emphasizing both basic concepts of spatial organization and the processes involved in temporal change. The second and largest section of the book delves more deeply into the details of both topics. It would, by itself, make a very nice supplemental text for use in river restoration or fluvial ecology courses. Overall, readers interested in restoration issues, river science, and of course geomorphology, will find “Geomorphology and River Management: Applications of the River Styles Framework” a useful reference work. The combination of comprehensive review of principals (Parts A and B) with an explicit methods primer and case study (Part C) undoubtedly makes this a powerful training document for those directly interested in understanding or implementing the Rivers Styles approach. At the same time, this combination of generality and specific methodology makes the book a less obvious choice for use in university courses and workshops. For readers interested in riverine wetlands, Brierley and Fryirs’ new book provides a lot of useful background but little integration of geomorphology with fluvial ecology.” – Michael J Wiley, School of Natural Resources and Environment, University of Michigan, in WETLANDS vol. 26 no. 3, September 2006, pp. 884-885. Geomorphic Analysis of River Systems: An approach to Reading the Landscape. John Wiley and Sons, Chichester, 345pp. Reading the Landscape entails making sense of what a riverscape looks like, how it work, how it has evolved over time and how alterations to one part of a catchment may have secondary consequences elsewhere, over different timeframes. These place-based field analyses are framed within their topographic, climatic and environmental context. Issues and principles presented in the first part of this book provide foundational understandings that underpin the approach to reading the landscape that is presented in the second half of the book. In reading the landscape, detective-style investigations and interpretations are tied to theoretical and conceptual principles to generate catchment-specific analyses of river character, behaviour and evolution, including responses to human disturbance. This book has been constructed as an introductory text on river landscapes, proving a bridge and/or companion to quantitatively-framed or modelled approaches to landscape analysis that are addressed elsewhere. Key principles outlined in the book emphasise the importance of complexity, contingency and emergence in interpreting the character, behaviour and evolution of any given system. The target audience is second and third year undergraduate students in geomorphology, hydrology, earth science and environmental science, as well as river practitioners who use geomorphic understandings to guide scientific and/or management applications. Case studies explore practical applications in different parts of the world, highlighting approaches to the use of integrative river science, measures of success, and steps that could be taken to improve performance in future efforts. River Futures offers a positive, practical, and constructive focus that directly addresses the major challenge of a new era of river conservation and rehabilitation—that of bringing together the diverse and typically discipline-bound sets of knowledge and practices that are involved in repairing rivers. It is a valuable resource for anyone involved in river restoration and management, including restorationists, scientists, managers, and policymakers, as well as undergraduate and graduate students. Across much of the industrialized world, rivers that were physically transformed and ecologically ruined to facilitate industrial and agricultural development are now the focus of restoration and rehabilitation efforts. 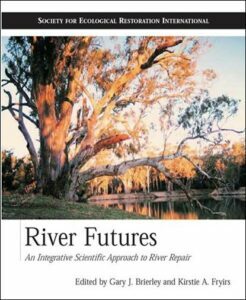 River Futures discusses the emergence of this new era of river repair and documents a comprehensive biophysical framework for river science and management. The book considers what can be done to maximize prospects for improving river health while maintaining or enhancing the provision of ecosystem services over the next fifty to one-hundred years. It provides a holistic overview of considerations that underpin the use of science in river management emphasizing cross-disciplinary understanding that builds on a landscape template.